Lighting up a bonfire can be an eye candy at home or even as you explore the outdoors with these easy-to-do simple mini fire pit ideas. Bond around a bonfire tonight with as you reinvent one of the ideas featured in this post. Great conversations over a cup of hot chocolate and a few burnt marshmallow from your mini fire pit at your very own backyard is a nice way to start or end the weekend. Bring that warm experience anywhere by trying out one of these creative and simple DIY mini fire pit ideas for your small yard or even for your outdoor adventures. 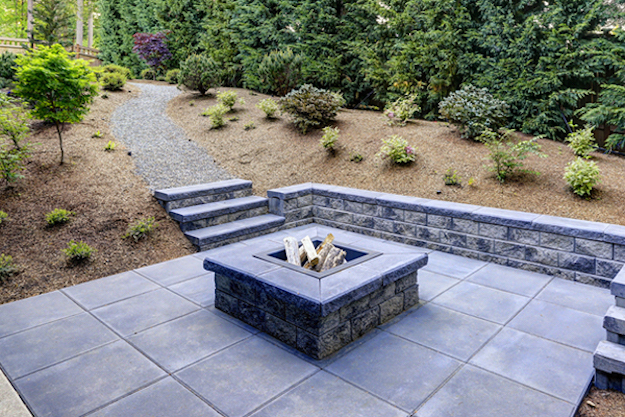 If you really have a small area in your yard or have a deck at the back of your house, opting for a smaller fire pit, just big enough to fit in a coffee table is a good idea to keep the chilly weather warm even outdoors. A concrete bowl fire pit will do the job. This is one of the most elaborately designed on the list. Secure your metal washing machine drum from a busted front loading washing machine by attaching angular bars as its base. Paint it with copper or bronze and enjoy how the fire dances as you gather around the fire. Building a fire pit out of scrap metals is also possible and can be intricately designed as well. Simply weld small pieces to create a square or rectangular pit where you can place your wood for the fire. You can also bend metal sheets if you have large metal scraps available to create your DIY mini fire pit. I love sitting on our front porch looking at the nearby houses and enjoying the simplicity of the neighborhood. That’s when I notice Lauren’s extra flower pots and decided to make a mobile fire pit from it. What’s better than a great conversation with your loved one? I prefer a glass of margarita to go with my bonding sessions with my wife. Well, guess what? You can creatively transform your good old margarita glass into a desktop mini fire pit. Perfect to warm up any conversation. Another portable mini fire pits featured on this list. Metal planters are readily available almost anywhere. I might actually have one stored on one of the boxes that I have in my garage. Glass, on the other hand, makes anything looks classy and expensive. Simply combining the two would create a stunning centerpiece for your Christmas table or for any cold nights in the future. I always see several heavy duty tubs like this in farms and poultry areas. While busy tending to their flock, you might want to consider having one of these handy pieces converted into a mini fire pit to warm yourself up during those winter or cold nights. Simply add gravel onto the base of your tub. This will later on hold the wood or charcoal that you will lit to set a fire. A tall or short metal base would be advisable to be able to make your fire pit mobile. I bet Lauren can create one of these in less than an hour. Pour sanitized inside the center tin can and light it up. It would create a blue flame and is a nice centerpiece that can be used both indoors and outside. This DIY mini fire pit is one of my favorites and inspiration in creating this list. Simply weld deconstructed 4-inch square tube bars into a square bar to achieve the look. It’s a nice piece you can also have in your front yard to light up and warm up your place at night. Get toasty and enjoy a night outdoors without worrying about getting cold with your very own mini fire pit outdoors. Here is an instructional video that can help you create your own concrete fire bowl for less than 5 dollars! Putting your heart and creativity into creating a new thing out of something you already thought had no use always brings spectacular results. Challenge your creative juices to do more to create unexpected pieces from simple materials and readily available items found right at your homes. Inspired to create a mini fire pit as your next DIY project? I would love to hear your stories and experience on our comment section. Are you ready for a bigger and more challenging outdoor project this weekend? Try these Unique DIY Fire Pit Ideas to Amaze Your Guests instead!